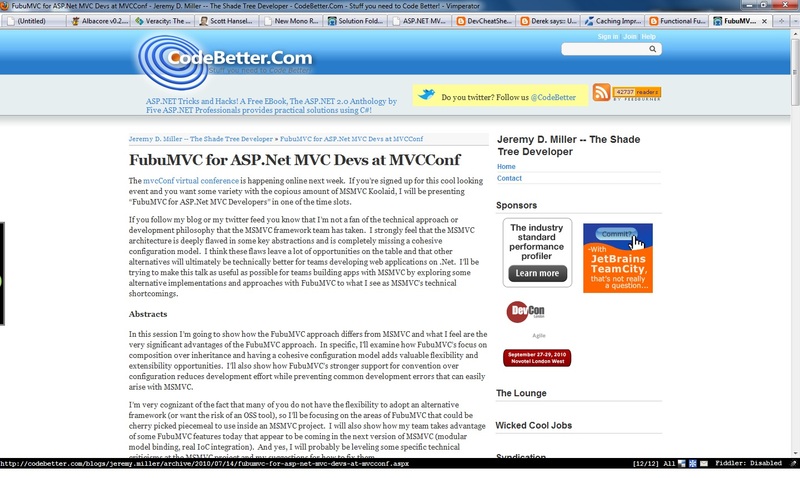 I guess most of the .NET Devs read The Morning Brew, if not you should. It is a morning newspaper for the dev, so I end up reading it first thing when I go to work. I like to try and automate most of the stuff . So I thought why not write a script that reads the Morning Brew feed, filter the excluded content that I am not interested in and open the urls before I come in. The reason behind using F# is I don’t have to compile the code. I could use it with FSI.exe. Incase if the extraction logic changes and I don’t have to recompile , it is just fixing the script. The best part of writing in F# is I avoid all the ceremony. Here is the F# code, it is nothing fancy. And this code can easily be modified for other link collection sites. "C:\Program Files (x86)\Microsoft F#\v4.0\Fsi.exe" --quiet --exec "C:\Users\naveen\morningbrew.fsx"